Citation: Schulenkorf, N. Sport for Development events and social capital building: a critical analysis of experiences from Sri Lanka. Journal of Sport for Development. 2013; 1(1): 25-36. Most of the ‘evidence’ that sport and event projects contribute to positive social development in divided societies remains anecdotal. In answering the call for empirical evaluations, this paper investigated the role of a sport-for-development project in contributing to intergroup development and social capital building between disparate communities in ethnically divided Sri Lanka. Thirty-one semi-structured interviews were conducted with various stakeholders after the weekend-long Intercultural Sports Meeting (ISM) project in rural Sri Lanka, assessing participant experiences, behaviour, and attitudinal changes. Findings suggest that socially focused short-term initiatives have the potential to be a source and a vehicle for inter-community development; they can provide much needed excitement, animation and vibrancy. However, to contribute to sustainable social benefits sport events ought to be used to grow and leverage a nested sport-for-development programme instead of being featured as a stand-alone exercise. In fact, the ability of short-term interventions to create social capital needs to be critically assessed and claims about events’ lasting contributions to social capital should be treated with caution. Around the world, government agencies and NGOs have become increasingly conscious of the possible role that sport, events, and leisure activities play in reducing social barriers, subduing inter-community strife, building capacities, and helping to give a semblance of normality to an otherwise divided and intermittently violent societies. The 2006 United Nations Report of the Secretary-General titled Sport for Development and Peace: The Way Forward1 outlines that world leaders have now realised that sport activities not only contribute to creating physical wellbeing, but they “can foster peace and development and can contribute to an atmosphere of tolerance and understanding” (p2). Despite the strong theoretical and anecdotal support highlighting that sport and event programmes can have a positive impact on communities, little empirical evidence supports this claim – particularly in relation to culturally or ethnically divided societies.2-4 The social and cultural experiences generated through participation in sport-for-development (SFD) projects still need to be explored to determine if and how they can contribute to building bridges between disparate groups. Empirical socio-managerial investigations are needed to identify how decision makers can strategically use such programmes as a tool for social capital and peace building. This paper responds to the call for empirical evidence by investigating the ability of an inter-community SFD project to enable social capital building in the context of an ethnically divided society. In particular, the social experiences at a youth sport project in rural Sri Lanka are examined and the link between project experiences, sport management and wider social community outcomes is highlighted. The paper forms part of a larger study that investigated the role of sport events in contributing to social development between disparate communities. Inevitably, social capital is accumulated through interactions: interactions between individuals, between individuals and groups, and between groups.8,9 When focusing on inter-community relationships and social development, the definition suggested by Baum, Palmer, Modra, Murray and Bush10 is valuable. It states that social capital is “the building of healthy communities through collective, mutually beneficial interactions and accomplishments, particularly those demonstrated through social and civic participation” (p251). This definition highlights the importance of participatory processes and cooperation needed to achieve positive social outcomes within and between groups. The modern debate around social capital derives from three main theorists: Bourdieu11, Coleman12 and Putnam.13-15 Although there are significant differences in their understanding and use of the concept, Coalter16 argued that as a common element, social capital refers to social networks based on norms and values that enable people to trust and cooperate with each other, and through which groups can obtain different types of advantage. While Bourdieu views social capital as positional good and an “exclusive property of elites, designed to secure their relative position”17, for Coleman social capital has a more neutral meaning and refers to social structures and relationships which facilitate actions. He sees social capital as a resource that can be generated – but also exclusively limited – through networks of relationships, reciprocity, trust, and social norms.18 Putnam on the other hand values social capital as a public good, which requires participation as a core element to bind groups and communities together. As Coalter16 suggested, Putnam views the civic engagement in joint activities as an important element for the creation of social capital, as it improves the effectiveness of communities in achieving desired social, cultural and/or socio-economic outcomes. Putnam13-15 proposed two main components of social capital, bonding social capital and bridging social capital. Bonding refers to the value assigned to intragroup connections or social networks between homogeneous groups of people. While the intra-community concept of bonding social capital is often of great value to group members, an entire ‘closing’ of the group to outsiders may actually be ineffective for its overall development. For example, a group that focuses entirely on bonding social capital (e.g. the Klu Klux Klan) is inward looking and tends to reinforce exclusive identities.19 The expansion to wider circles can be described as bridging social capital, which happens between communities and extends to individuals and groups that are more removed. The bridging element of social capital tends to be weaker but more diverse and inclusive of people of different backgrounds. According to Mattsson20“bridging social capital is based on an emotional process where trust is generalised and mediated through social norms and directed towards other people that we do not know very well”. Recently, authors have questioned whether a distinction between bonding and bridging is sufficient to capture the value of different types of social capital; a third component linking social capital has since been advocated.21,22 Linking refers to the relationships of individuals and groups with people in positions of influence within formal institutions. It is the idea to draw resources, ideas and information from these formal institutions into communities or groups, in an attempt to ‘getting things done’ and leveraging valuable assets. More colloquially, the key point of linking social capital is that “it’s not what you know, it’s who you know”.22 Linking with trustworthy and supportive people in positions of institutional power may thus help to avoid bureaucratic problems, and secure essential political and/or financial community support. 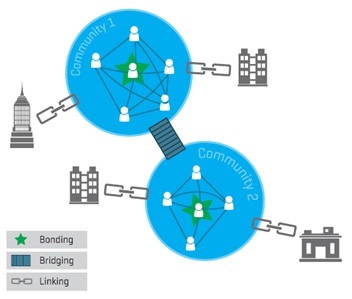 The interplay of bonding, bridging and linking social capital is visually displayed below. Looking at sport participation among Dutch immigrants in the Netherlands, Verweel and Anthonissen26 analysed social capital building in multicultural sport clubs and revealed four key dimensions of social capital benefits: the development of social and emotional skills (e.g. honouring agreements); reciprocal service provision (offering help and receiving advice or support in other areas); forming social relationships (including confident and open discussion of ethnic boundaries and differences between people); and social participation (which can lead to learning about one self and others, which can then enhance social acceptance). However, other social capital research from the Netherlands warns us that sport does not automatically provide bridges for disparate communities; sport may in fact serve as a locus for intergroup division.27,28For example, members of marginalised groups have used sport clubs as an outlet in which they exclusively confirm their ethnic identity through homogeneous activities. In relation to these findings it is important to acknowledge that sport per se is not necessarily a social good. For example, Kidd29 argued that in and of itself, sport is of no intrinsic value: it is neither naturally good nor irrevocably bad. Similarly, Sugden30 suggested, “it is like all collective human endeavours, a social construction which is malleable according to the social forces that surround it”. This means that the success of sport in ‘doing good’ and creating social capital depends on the context and the management of a supportive (social, cultural, political, resource and sport) environment. When looking at the available research on sport and social capital it becomes obvious that most studies have been conducted in club environments within highly developed countries. There is a dearth of empirical studies that look at the generation of social capital around SFD initiatives in a developing world context and only anecdotal evidence suggests that active involvement in SFD can help people to establish new friendships, networks or links, which add to the overall stock of social capital. Hence, the organisation of – and participation in – sport projects may provide a superordinate goal for people and groups.31 In Wartburton’s32 words, “one way forward is through new forms of collective action which are based less on the shared characteristics of specific groups and more on coalition building, networks and alliances between different groups who recognise a common cause” (p35). SFD projects may well present such a common cause. Investigating the potential of sporting events in facilitating social relations and social development, Misener and Mason23 suggested that short-term interventions can also provide ‘fresh spaces’ that bring communities together through participation, planning, volunteering and spectating. However, no empirical investigation was conducted to support these claims and the question remains what role short-term initiatives (e.g. sporting events or SFD projects) can truly play in the creation of social capital. Finally, it needs to be acknowledged that the production and utilisation of social capital depends to a certain degree on the quality and resource content of the social relationships and networks. For example, for disadvantaged communities in the developing world there are often limited opportunities of ‘getting things done’. In other words, community members may create strong social and cultural bonds with each other but the potential of turning strong social ties into tangible material benefits are restricted. People may lack financial resources or technical knowledge that people from the Western World may take for granted. In the context of a divided society another significant challenge for development workers and management staff is the design of initiatives and activities that attract communities from all sides. One such opportunity is presented by SFD projects, which provide a rich testing ground for social experiences, intergroup development and the contribution to (or reduction of) the stock of social capital. Intergroup relations within multi-ethnic Sri Lanka have been fraught with difficulties for several decades. The Tamil minority has been distrustful of the country’s unitary form of government, believing that the Sinhalese majority would abuse Tamil rights.35 In the 1970s, the Liberation Tigers of Tamil Eelam (LTTE or Tamil Tigers) were formed to fight for self-sovereignty in the north-eastern regions of Sri Lanka, which are considered the areas of traditional Tamil settlement. Seeing themselves as the acting representative of the Tamil people, the LTTE’s violent demands culminated in a civil war that lasted from 1983 – 2002 and resulted in over 70,000 casualties36In north-eastern Sri Lanka, the Tamil Tigers managed to establish a de facto state with its own military, police, schools, laws and courts. In 2002, the Government of Sri Lanka and the LTTE entered into official negotiations aimed at solving the country’s ethnic and political divides. While the LTTE withdrew from active peace talks after six rounds in April 2003, a cease-fire agreement remained in place. However, the agreement was constantly violated by both parties, which resulted in the Sri Lankan Government withdrawing from it and returning to a full-blown civil war in January 2008. Fourteen months later, the Government was able to announce victory over the Tamil Tigers. However, until today civil society in Sri Lanka is still suffering heavily from the social, economic, and political consequences of the civil war.Against the background of a deeply divided society, interviews for this study were conducted in western Sri Lanka from January until April 2007. At that point in time, the LTTE controlled 15% of the island and claimed another 20% as their traditional homeland. For this paper the experiences created at A.G.S.E.P.’s 2007 Intercultural Sports Meeting (ISM) project were investigated. The project’s effect on intergroup relations and the stock of social capital available to the three disparate Sri Lankan communities Marawila/Nattandiya (Sinhalese, western Sri Lanka), Anamaduwa (Sinhalese, north-western Sri Lanka) and Nilaveli (Tamil and Muslim, LTTE controlled north-eastern Sri Lanka) was also explored. The ISM can be described as a sportplus project (see38). It reached 150 young Sri Lankans between the ages of 6 and 16 years, who came together for a multi-sports event project that offered cricket, football and volleyball games, creative sports, swimming clinics, and a variety of cultural performances over a long weekend in January 2007. All sport activities were staged in the multi-purpose sports venue Peace Village in the rural fishing village of Nattandiya. Importantly, the ISM formed part of an established and nested SFD programme orchestrated by the Marawila/Nattandiya communities. Under a ‘Games for Peace’ umbrella – and with significant support by the German aid agency Friedensdorf International (Peace Village International) – the communities engaged in regular sport and physical activity programmes with the intention of deepening existing relationships and networks. On the other hand, ‘highlight events’ such as the ISM looked at a widening of participation and programme scope. They were used to showcase the SFD programme and its related initiatives to a wider cross-section of a host community, including potentially new participants, family members, sponsors, government bodies and sport associations. The Guest of Honour and the Minister for Nation Building in Sri Lanka, Mr. Dassanayake, officially opened the ISM. After a number of cultural performances and welcome speeches, the children were split into ethnically mixed groups that engaged in different sport activities. Cricket and football were chosen for their potential in team-building and co-operation; creative sports, arts and crafts promised to allow for the expression of talent and interest in ‘something new and different’; and swimming sessions had the educational advantage of teaching the children a new skill – water having become associated with danger for a large proportion of the Sri Lankan youth after the Tsunami disaster in 2004.39 Further, cultural performances and dance shows provided a special flair during the evening programme, which led into nights of music and dancing at the Peace Village complex. The organisers tried to provide for both structured sport activities and free time for the children to play with each other and enjoy the company of their old and new friends. Importantly, at all structured activities competition was played down to avoid potential conflicts, and to preserve the fun and enjoyment aspects of the games. This research employed a case study approach (see 40) to examine people’s social experiences and the ISM’s role in developing intergroup relations and the building of social capital. Thirty-one semi-structured interviews conducted after the completion of the ISM sport project. In cooperation with A.G.S.E.P. and the ethnic communities, key individuals from the communities and main programme stakeholders were identified for the initial round of interviews. Further interview respondents were accessed through the use of a snowball sampling technique (see e.g. 41). The combination of community representatives previously known by A.G.S.E.P. and the snowball method resulted in access to a variety of interviewees, ranging from local fishermen to high profile Members of Parliament. The wide range of local voices helped to provide a well-rounded representation of voices of the local population. However, a certain desirability bias needs to be acknowledged here, given that the majority of interviewees came with the intention of supporting the SFD initiative in the first place. The interviews were conducted between January and April 2007 and lasted between 35 and 120 minutes. They included questions on the social impacts experienced over the weekend; the relations and behaviour between people at the SFD programme; and the potential influence on a common spirit or attitudinal changes between people and groups. In cases where the respondents’ English proficiency did not allow adequate responses, a local Sinhala and Tamil speaking interpreter assisted them. The computer software used to support the qualitative analysis was NVivo, which assisted the researcher in storing, integrating, indexing, and coding the large amount of data collected. The ISM event weekend provided a space for collective action and resulted in different socio-cultural experiences for participants, spectators and other event stakeholders. Their experiences were grouped under eight themes: Socialising, Comfort, Reciprocal Support, Networking, Learning, Cultural Celebration, Attitudinal Differences, and Management Tensions. The individual themes are presented below, drawing on representative comments from interview respondents who were given pseudonyms to guarantee a confidential yet personal presentation of findings. [It was] a really positive consequence that [people] were working and playing together: there were Tamils and Muslims and Sinhalese and they were engaged in creative work, painting on a big paper, playing football, swimming together… that’s a really, really big achievement considering the political situation in our country. The sport project was described as a vehicle for active participation with an interesting combination of Sri Lankan and international sportspeople. While international volunteers came from different European countries, members of the participating Sri Lankan communities came from different parts of the island to be part of the event. Facility manager Shanto highlighted that the event also allowed for a contribution of groups from rural Sri Lanka who are often not given the opportunity to actively participate, exercise and socialise. He argued that, “especially young people from these areas who have talent and like sports, but who normally don’t get a chance to show it, they could participate in the event”. Shanto went on to say that active performance and socialising contributed to a rise in participants’ satisfaction and happiness, and the emergence of first friendship ties. It was a very safe event, because of the location of the Peace Village. It’s far away from a big city. And there is no one disturbing the activities; it’s a little bit away from other people from the villages, too. So the children can feel safe here. The children from Nilaveli came out of a really troubled area and were playing together with all the kids and having fun in the pool. It was something very special for them and I could see they had a good time and forgot the hardships of the daily life. I saw that in between all the people… there was some kind of a trust. I don’t say it’s 100%. But some kind of a trust, that’s why I say it was more or less a confidence building or trust building exercise. The day when the groups had to leave each other, I saw, you know, the children were crying, hugging each other, kissing each other. And that was one of the most sensational events. And that showed me that, you know … through the sport you can make a network of friends. This display of affection and friendship is seen as a strong indicator of the event’s success in having contributed to emotional links between the children and communities. When considering that in the Sri Lankan culture emotions are generally controlled when meeting previously unknown people, the hugging and kissing of ‘others’ is certainly a powerful social intergroup response. In some instances the emotional engagement of people led to subsequent invitations to visit each other. This suggests that at least a number of inter-community relationships lasted beyond event borders; however, follow-up studies are required to substantiate the claims for ongoing connections. The children were able to celebrate, but they also learnt to digest defeat, as did the trainers, the coaches, the schools and so on. What sport brings for the society in a positive way is to accept defeat, and stand up after the defeat on the following day! Start again, train again, improve the skills, try to win, lose again, stand up on your feet, and so on and so on. Didi felt that accepting defeat is particularly important for children living in an ethnically divided country like Sri Lanka, where admitting defeat against ‘others’ is still a taboo. Jayo supported this view, saying that in “a country where a battle is going… no party is willing to accept losses. In the case of sport, here, the losing party has learned to accept losing as well. That is some new feeling and an important experience for us”. I really like to meet other cultures and celebrate with people from other cultures… They have totally different points of view about nearly everything: life, maybe religion, food, music, whatever, you know. It’s totally different to the Europeans – that’s the reason why I said the event was really interesting for me. At the end of the first day the different ethnic groups and the international volunteers engaged in an inter-cultural event night where they learned about different dance moves and theatre performances. European spectator Katja argued that all participants and particularly the dancing performers had the invaluable opportunity to showcase their talent to a wider inter-ethnic audience. They remembered that “we learned about [each other’s] traditions and it was a really good experience for both sides to show their customs… And [the adults] could show the kids that they are proud of what they’re doing.” The cultural programme resulted in great appreciation and a joint celebration, where groups engaged in combined cultural performances. A very excited Didi explained that the performances allowed Sri Lankan people to “find unifying connecting points with the others”, as they came to realise that their cultures have common elements and rituals. Comments themed under ‘Attitudinal Differences’ refer to varying levels of affect, enthusiasm and engagement towards the social sport theme, as well as differences in attitudes towards the sport event organisers, participants and spectators. Shanto remembered that leading up to the project, some community members – who were not directly involved – spoke negatively about the organisers: “There were stories spreading that [a school] principal was saying: ‘[They] are showing our children to rich tourists and they are getting money from Germany and we get nothing!’” Although Shanto perceived the principal to have been drinking at the time he made this statement, he believed that there is a potential for externally supported events to create feelings of angst, uncertainty or jealousy among parts of the community. There were some disharmonies, I would say. For example the swimming teacher: he was there to show some children how to swim. But he only swam around alone in the pool; he had a look at the children, so that they don’t get under the water, that was good, but I asked him if he wants to show some boys or girls how to swim, but he didn’t want to and he said: “Naa, they want to play and that’s enough”. We thought they (the Ministry) knew what we (A.G.S.E.P.) wanted to do with this event. But we didn’t explain well enough what our goals and objectives were. [Probably] they saw it as just another sport event and did not put as much heart into it as we did. The communication issues and socio-management tensions resulted in lost opportunities to grow and leverage the event benefits. Some of the event attendees and stakeholders “noticed that participation of supporters and families was low, which was a bit disappointing”. Respondents discussed the reasons for the low number of event spectators and Arndt suggested that a lack of promotion and advertising might have been a significant factor, as “maybe not so many people knew about the ISM, its purpose and value.” Other voices were raised that some locals may not have found the focus on proactive civil peace building to be relevant or powerful enough. The main purpose of the ISM project was to enhance intergroup relations and contribute to positive social development between participating Sinhalese, Tamil and Muslim communities. This section discusses people’s socio-cultural experiences and the project’s management approach, and critically investigates how these constituents influenced relationships and the social capital available to the disparate groups. First, the ISM provided opportunities for entertainment and interaction and allowed communities to socialise. Locals were able to participate in active community life by taking up positions in the organising team, as volunteers, supporters, attendees or participants. Misener and Mason23 had pointed towards these social benefits before; however, around the ISM an ethnically mixed stakeholder group including members from disparate rural communities had the chance to a) share their experience with each other, b) contribute to the innovative idea of peace-building through sport, and c) celebrate with newly made friends. These social opportunities resulted in what Baum et al.10 described as “mutually beneficial interactions and accomplishments” between people of mixed ethnic background. The inter-community relationships established through social participation and exchange contributed to the bridging social capital that was created; new links to sponsors and government institutions relate to the linking component of social capital. Clearly, a starting point was created and first important intergroup contacts were facilitated through the inter-community project; in other words, there is a contribution to the stock of social capital available to communities. However, it is too early to claim that the project was able to create strong social ties (see 42) or thick layers of social capital between people and their communities. Follow-up research needs to examine the sustainability of weak ties, and the different opportunities of strengthening them. Unfortunately, funding constraints and the difficulty of accessing participants and stakeholders years after the event prohibited the assessment of these important factors. Second, the ISM was thought to contribute to feelings of comfort, safety and confidence. The project was considered a promising source for the creation of comfortable and trustworthy relationships, where different factors such as the presence of an impartial organiser and the official endorsement from all communities contributed to feelings of generalised and institutional trust (see 43,44). In particular, the safe location and the engaging leisure atmosphere of the ISM added to feelings of comfort, reinforcing Lederach’s 45 argument that purposely designed sport projects have the potential to provide a locus of peace – even if only for a short period of time. Considering the social context of the projects in Sri Lanka, the creation of a comfortable intergroup environment is a significant achievement. Meanwhile, we need to be careful not to interpret an increase in comfort level as a significant development of trust between communities. In fact, at this stage it seems too early to expect that the level of trust – and the stock of social capital – within the new inter-community sport network is sufficient to facilitate, for example, confident and open discussions of ethnic boundaries and differences, as highlighted by Verweel and Anthonissen.26 In the future, however, once generalised and institutionalised trust has been advanced through subsequent interaction, communities and sport organisers may have the opportunity to intensify and expand their social exchanges within and outside the project frame. Ongoing engagement may thus (re)produce stronger layers of bridging and linking social capital. Third and fourth, the inter-community project facilitated opportunities to establish networks and reciprocity between groups and project stakeholders. The preparation phase and the weekend itself allowed organisers, participants and supporters to connect and share with previously unknown people (bridging), or intensify pre-existing friendships (bonding). These experiences concur with Verweel and Anthonissen’s 26dimension of ‘reciprocal service provision’ where overall, sharing with others is considered an important element of bridging social capital.13,14,43Furthermore, a number of follow-up meetings and private invitations suggest that reciprocal relations and networks were continued post event. However, it remains to be seen if relationships and networks are actually sustained in the long-term, especially in a socio-economic environment where communities are often resource-poor and technologically disadvantaged. For example, management knowledge in rural Sri Lanka is limited; opportunities for phone conversations or email contact is restricted; financial means for long-distance travel are scarce; and people in the Northern parts of Sri Lanka are challenged or even restrained in receiving official travel permits from the government. A systematic approach towards community capacity building is therefore critical if development agencies or ‘change agents’ are serious about achieving true social development and empowerment in disadvantaged settings (see 46). To increase opportunities for everyone in the community, it will be important for participants and organisers to think strategically and facilitate steps towards a sustainable development of relationships and networks. In an attempt to maximise positive social experiences and create sustainable social outcomes, they may start to leverage sport projects or – in other words – create linking social capital through closer cooperation with governmental organisations (see 47). Here, a combination of ‘highlight events’ and a nested SFD project (such as A.G.S.E.P.’s ‘Games for Peace’ campaign) seems most promising in highlighting and managing wider social community issues, including intergroup development, educational initiatives and/or health campaigns (see e.g. 2,48-50). Fifth, ‘Learning’ represents the project’s contribution to capacity building, as people can gain knowledge and skills in sport and culture. For example, during the ISM, participants were able to develop swimming skills. An earlier study conducted by Straubinger39 had shown that after the Tsunami Disaster in 2004, water had become an element of fear and danger for a large proportion of the Sri Lankan youth. Therefore, learning swimming skills built an important and at times liberating experience for participants. At the same time, supporting creative arts and drama classes at the ISM provided an alternative opportunity for children to express themselves freely in a favourable social environment. Theatre performances and paintings allowed children to share feelings of joy, but also of fear and pain. The sharing of such intimate experiences impressed participants, volunteers and teachers, and allowed them to share, understand, connect, and empathise with each other. Indeed, the findings suggest that being temporarily disconnected from the hardships of daily life was both psychologically and socially liberating. This implies that the conditions of different sportplus elements (e.g. downplay of competition and the focus on social and cultural values) and context of the project (e.g. its locality and community support) are important success factors, not the use of sport per se (see also 29,30). Sixth, ‘Cultural Celebration’ is an area with particular relevance for inter-community sportplus programmes. The opportunity to showcase and celebrate one’s culture and learn about other groups’ traditions was considered an exciting experience and resulted in an increase in the appreciation of diversity. With a focus on inclusive activities, ‘Cultural Celebration’ may thus lead to an improved perception of equality between communities. Despite the fact that this change may be temporary, it seems particularly important for intervention programmes in a society where one of the main challenges is to deconstruct the relations of power and the politics that render some dominant (Sinhalese) and others marginalised (Tamils and Muslims). The potential long-term consequences of this change will have to be investigated in future research. It must be recognised here that SFD programmes do not automatically result in benefits for all those involved or affected by them. At the ISM, it was found that attitudes differed among individuals and groups. Proactivity and enthusiasm to engage with ‘others’ and with the ‘Games for Peace’ themes varied, which at times led to disagreement and tension. This suggests that at socially-focused reconciliation projects dedicated peace-activists can be left frustrated and disappointed with participants or stakeholders who focus predominantly on ‘doing their job’. Such impacts can affect social dynamics before, during and beyond an event, which speaks to the importance of open and inclusive communication and strategic planning throughout the entire campaign. Finally, pessimistic and judgmental comments about the programme organisers and participants suggest that parts of the community did not accept the idea of inter-community celebration; some may have found the focus on sport meaningless, while others perhaps rejected the idea of a Western change agent organising events in a developing country (see e.g. 51). This speaks to the limits of sport to bridge severe cultural and social divides, and the importance of empowering local sport event organisers through ongoing cooperation and a strategic transfer for power and responsibilities over time. The term ‘sport-for-development’ has been used to describe a great variety of both short-term and long-term initiatives aiming to make a positive difference for disadvantaged people and communities. To avoid confusion and an over-simplification of the term, it seems necessary to clearly define and acknowledge a project’s character, duration, structure, and intended outcomes (see 50). Only critical analyses will prevent us from superficial and evangelistic sentiments, and will allow us to provide realistic assessments of sport projects’ contribution to – and limitation in – creating social capital. In and of themselves short-term interventions such as sport event weekends may be limited in achieving lasting change in divided societies and this needs to be understood and acknowledged by communities, organisers and funding bodies. However, as indicated in this study, sport and event projects can play a role in starting a significant process; they may contribute to intergroup development and add to the stock of social capital. To develop this potential into lasting social benefits, organisers and communities need to engage in long-term cooperation and follow-up activities. In other words, short-term interventions may kick-start wider social outcomes such as reconciliation and peace only if positive impacts are maximised and benefits are leveraged. The findings and recommendations from this study will hopefully inform the strategies and guidelines of future SFD initiatives, which are to ensure that they reach their potential as vehicles for inter-community togetherness and build social capital building. 1. United Nations. Sport for Development and Peace: The Way Forward. Sixty-first session, Agenda item 49, A/61/373, United Nations General Assembly, 2006. 2. Chalip L. Towards Social Leverage of Sport Events. Journal of Sport and Tourism. 2006;11(2):109-27. 3. Nicholson M, Hoye R. Sport and Social Capital. Oxford: Butterworth-Heinemann; 2008. 4. Coalter F. A Wider Social Role for Sport: Who’s Keeping the Score. Abingdon, Oxon: Routledge; 2007. 5. Hanifan LJ. The rural school community centre. Annals of the American Academy of Political and Social Science. 1916;67:130-8. 6. Sabatini F. An Inquiry into the Empirics of Social Capital and Economic Development [PhD]: University of Rome La Sapienza, Rome; 2005. 7. Robinson LJ, Schmid AA, Siles ME. Is social capital really capital? Review of Social Economy. 2002;60(1):1-24. 8. Dekker P, Uslaner EM. Introduction. In: Uslaner EM, editor. Social Capital and Participation in Everyday Life. London: Routledge; 2001. 9. Adler P, Kwon S-W. Social Capital: Prospects For a New Concept. The Academy of Management Review. 2002;27(11):17-40. 10. Baum F, Palmer C, Modra C, Murray C, Bush R. Families, social capital and health. In: Winter I, editor. Social Capital and Public Policy in Australia. Melbourne: Australian Institute of Family Studies; 2000. p. 250-75. 11. Bordieu P. The forms of capital. In: Richards J, editor. Handbook of Theory and Research for the Sociology of Education. New York: Greenwood Press; 1986. p. 241-58. 12. Coleman JS. Social capital in the creation of human capital. American Journal of Sociology. 1988;94(1):95-120. 13. Putnam RD. Making Democracy Work: Civic Traditions in Modern Italy. Princeton, NJ: Princeton University Press; 1993. 14. Putnam RD. Bowling Alone: The Collapse and Revival of American Community. New York: Simon & Schuster; 2000. 15. Putnam RD. Better Together: Restoring the American Community. New York: Simon & Schuster; 2003. 16. Coalter F. Sport Clubs, Social Capital and Social Regeneration: ‘ill-defined interventions with hard to follow outcomes’? Sport in Society. 2007;10(4):537-59. 17. Field J. Social Capital. London: Routledge; 2003. 18. Portes A. Social Capital: Its Origins and Applications in Modern Sociology. Annual Review of Sociology. 1998;24:1-24. 19. Skinner J, Zakus D, Cowell J. Development through Sport: Building Social Capital in Disadvantaged Communities. Sport Management Review. 2008;11(3):253-75. 20. Mattsson M. Social capital supporting males – Findings from a community action research project in Sweden. Neighbourhoods and Social Capital; 29. April 2005; Ryde: Maquarie University’s Centre for Research on Social Inclusion; 2005. 21. Molinas J. The interactions of bonding, bridging and linking dimensions of social capital: evidence from rural Paraguay. In: Isham J, Kelly T, Ramaswamy S, editors. Social Capital and Economic Development. Cheltenham, UK: Edward Elgar Publications; 2002. p. 104-18. 22. Woolcock M. Social Capital, Civic Society and Poverty Reduction: Arrangements, Disagreements, Tensions. Canberra: Address to ANU Staff Association, 2001. 23. Misener L, Mason DS. Creating community networks: Can sporting events offer meaningful sources of social capital? Managing Leisure. 2006;11(1):39-56. 24. Arai S, Pedlar A. Building Communities Through Leisure: Citizen Participation in a Healthy Communities Initiative. Journal of Leisure Research. 1997;29(2):167-82. 25. Arai S, Pedlar A. Moving beyond individualism in leisure theory: A critical analysis of concepts of community and social engagement. Leisure Studies. 2003;22, (July 2003):185-202. 26. Verweel P, Anthonissen A. Ethnic Diversity in Organised Sport: Development of Social Capital by Dutch Immigrants. The Cyprus Journal of Sciences. 2006;4(Summer 2006):109-28. 27. Krouwel A, Boonstra N, Duyvendak JW, Veldboer L. ‘A Good Sport’? Research into the Capacity of Recreational Sport to Integrate Dutch Minorities. International Review for the Sociology of Sport. 2006;41(2):165-80. 28. Spaaij R. Sport as a Vehicle for Social Mobility and Regulation of Disadvantaged Urban Youth. International Review for the Sociology of Sport. 2009;44(2-3):247-64. 29. Kidd B. A new social movement: Sport for development and peace. Sport in Society. 2008;11(4):370-80. 30. Sugden J. Critical left-realism and sport interventions in divided societies. International Review for the Sociology of Sport. 2010;45(3):258-72. 31. Sherif M. Superordinate Goals in the Reduction of Intergroup Conflict: An experimental Evaluation. In: Austin WG, Worchel S, editors. The Social Psychology of Intergroup Relations. Monterey, California: Brooks/Cole Pub. Co.; 1979. p. 257-61. 32. Wartburton D. A passionate dialogue: community and sustainable development. In: Wartburton D, editor. Community and Sustainable Development: Participation in the Future. London: Earthscan; 1998. p. 1-39. 33. Nesiah D. Sri Lankan Nationalism, Ethnic Identity and Community. In: Raman B, Sathiya Moorthy N, Chittaranjan K, editors. Sri Lanka: Peace Without Process. Colombo: Vijitha Yapa Publications; 2006. p. 53-90. 34. Sri Lankan Department of Census and Statistics. Sri Lanka: Statistical Abstract 2001. Chapter 2. In: Department of Census and Statistics, editor. 2001. 35. Dunung S. Doing Business in Asia. New York: Lexington Books; 1995. 36. Bilger A. Kriegsangst im Urlaubsparadies. Der Spiegel Online. 2006 16. Juni 2006. 38. Coalter F. The politics of sport-for-development: Limited focus programmes and broad gauge problems? International Review for the Sociology of Sport. 2010;45(3):295-314. 39. Straubinger B. Water-Fear Study of the Trauma Relief Centre (unpublished). 2005. 41. Denzin NK, Lincoln YS. The SAGE handbook of qualitative research. 3rd ed. Thousand Oaks: Sage Publications; 2005. xix, 1210 p. p.
42. Granovetter MS. The Strength of Weak Ties. The American Journal of Sociology. 1973;78(6):1360-80. 43. Stone W. Measuring social capital: Towards a theoretically informed measurement framework for researching social capital in family and community life. Melbourne: Australian Institute of Family Studies, 2001. 44. Skelcher C, McCabe A, Lowndes V, Nanton P. Community Networks in Urban Regeneration: ‘It all depends on who you know’. Bristol: The Policy Press; 1996. 46. Schulenkorf N. The Roles and Responsibilities of a Change Agent in Sport Event Development Projects. Sport Management Review. 2010;13(2):118-28. 47. Woolcock M. The Place of Social Capital in Understanding Social and Economic Outcomes. Isuma: Canadian Journal of Policy Research. 2001;2(1):1-7. 48. O’Brien D. Points of Leverage: Maximising Host Community Benefit from a Regional Surfing Festival. European Sport Management Quarterly. 2007;7(2):141-65. 49. Schulenkorf N, Edwards D. Maximizing Positive Social Impacts: Strategies for Sustaining and Leveraging the Benefits of Inter-Community Sport Events in Divided Societies. Journal of Sport Management. 2012;26(5):379-90. 50. Schulenkorf N, Adair D. Temporality, transience and regularity in sport-for-development: synchronizing programs with events. Journal of Policy Research in Tourism, Leisure and Events. in press. 51. Guest AM. The diffusion of development-through-sport: analysing the history and practice of the Olympic Movement’s grassroots outreach to Africa. Sport in Society: Cultures, Commerce, Media, Politics. 2009;12(10):1336 – 52.